This our third year in Africa... three months into the New Year... time marches on. We just completed our fourth of six training seminars. 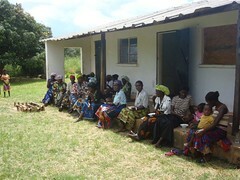 These are done six months each year to develop the emerging Zambian leadership and teachers of the new church plants. The other six months of the year these people are busy preparing, planting, and harvesting... food. 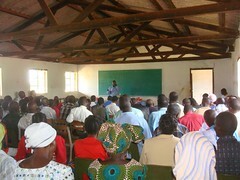 This last seminar was opened to the general public and all religious leaders of the area villages. Chief Mumena requested we open this seminar to the public because of certain activities taking place... “demons were troubling certain villages”. You see... in this place there are many unique traditions, customs, and beliefs... "witchcraft and juju". We do not think about these things as they are not our custom, yet here where centuries of traditions and stories, handed down from generation to generation, many live in fear and then there are always those who take advantageous opportunity for gain and power. How... ?... does one get into Christ... the safe place... Colossians 2:6-15... baptized into Christ. We had 157 people attending this seminar and many individual bible studies have developed from this topic. God is the power... it is God who created all things... it is God who holds them and us with His Word! For those . . . in Christ... we are safe! ... Amen! with their hands they weed and cultivate the field... with their hands they harvest the produce... food. Each family will prepare one lima (half acre) for food. If they fail... they do not eat. In the mornings (Monday thru Friday) we teach these people how to maximize their efforts. 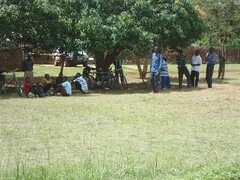 Most live each day with hope of finding enough food for the day to feed themselves... many days they will have nothing. “They have taught me the truth of God”... “they have helped me... God and the missionaries... to have this food”. He said, “last year my family was hungry... this year... we have food”. And he thanked God! This is the love of God... this is Jesus... this is what we do... this is what we teach. One day... God will destroy the world because of Satan, sin, darkness... evil! Before this... Jesus has promised to come to get us... those who are His... in Christ!